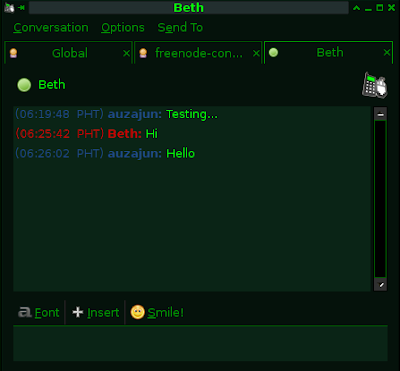 Did you know that Pidgin (formerly named Gaim), a Free and Open-source multi-platform (Instant Messaging) IM client, can be used to send and receive SMS text messages for free? This is made possible through Chikka, a wireless application service provider that's based here in the Philippines. 45 mobile carriers in fourteen countries including the US, UK, India, and Japan are currently supported by Chikka. At present, Chikka client doesn't have a Linux installer. However, Chikka’s recent interoperability with Google Talk gave it the ability to send and receive text messages through Google Talk. 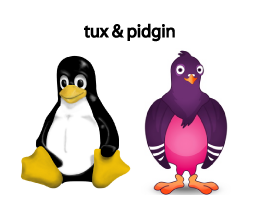 Since this is about sending and receiving text messages for free using Pidgin, I’ll cut to the chase and show you how to do it. 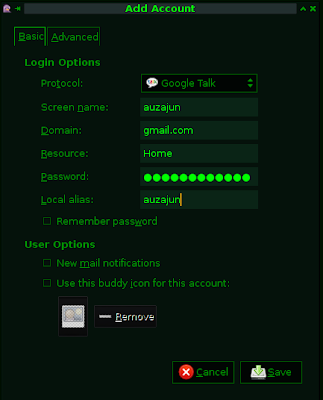 Assuming you already have a Google account, let's set up Google Talk in Pidgin by simply adding an account, and then filling up the necessary 'Login Options'. --Refer to screenshot below. After you have saved it, it will try to connect and login to your Google account. 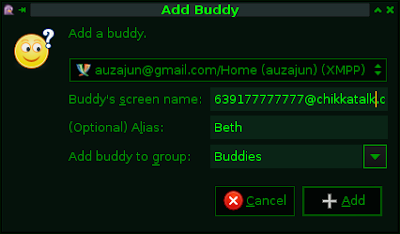 Once you have successful logged in, you can now 'Add a Buddy' or in this case, a textmate. Here's the not-so-secret way to do it. --The "Buddy's screen name" should be: CellphoneNumber(with country code) + @chikkatalk.com. e.g. 639177777777@chikkatalk.com. --See screenshot below. Click on 'Add'. And that's about it. Great post! I didn't knew about this future. Thanks alot! im from spain and this don`t work for me, i start pidgin with my account from google, add my own number... 34(spain)+xxxxxxxxx(movil)@chikkatalk.com ... but when i send a messagge, jump error in pidgin, code 407, any idea? saludos!!! From spain, the same as my mate above, anonymous. I'm in the US, and pidgin is also giving me a 407 error for my phone, which I have a chikka account for. It's way easier to just do this through AIM if the cell phone in the US. For someone whose number is 333-444-5555, send an IM to the screen name "+13334445555". I'm not sure how/if it works for other countries though. In case anyone is coming across this article now, it's worth noting that Google has removed this feature. At least in the US, a text message simply is an email. You can just email to <10digitnumber>@. For example <10digitnumber>@mms.att.net sends a text to your buddy on ATT. In the US, this is pointless. Also worth noting, Gmail has since brought back this feature (just type in the 10-digit number in chat).